Is the end upon us? [audio:http://www.truthrevolution.tv/show/TS-0298.mp3]No Flash Support? Use this Audio Player! 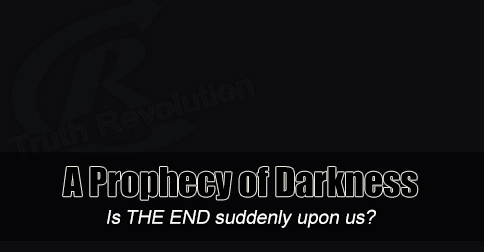 Dave: What is the 3 Days of Darkness prophecy? Jeff: They say, it will be the end of the world, or usher in the end of the world. Millions will die. Dave: Anna Maria Taigi was a seer who prophesied in 1863, and said all kinds of frightening things. The sky will go black for days, almost everyone will die unless they are God’s people who stay inside. Jeff: Even if you open your window out of curiosity during this time… DEAD! Dave: Fortunately, we don’t have to worry about that. We aren’t Catholic, but this isn’t even endorsed by the Holy See. Jeff: Plus, this is not a biblical thing, they are not exegeting Scripture. It’s not anti-Scripture, but it’s certainly not from Scripture. Dave: And, in fact, there is no scientific, or biblical, evidence to suggest that this will be the case.